Discussion in 'Axe, Tomahawk, & Hatchet Forum' started by Ernest DuBois, Sep 16, 2018. ...of a newly acquired axe that is broad in its bit, singular in its bevel. Not nearly to the point of satisfaction, only a beginning made. Square_peg, BamaDADx3, schmittie and 2 others like this. I am most curious of your process, and thoroughly enjoy reading and viewing your posts. I am intrigued and newly motivated to clean, sharpen and try my hand at useing a newly acquired, smaller broad bit, single bevel axe on some timber I have not yet processed for firewood. From your posts, @Old Axeman posts, the reading and viewing I have done...it only seems natural that I gain my own experience and knowledge first hand. Yes, I also love the scene of trenches gouged in the steel's surface by kernels of aluminum oxide. 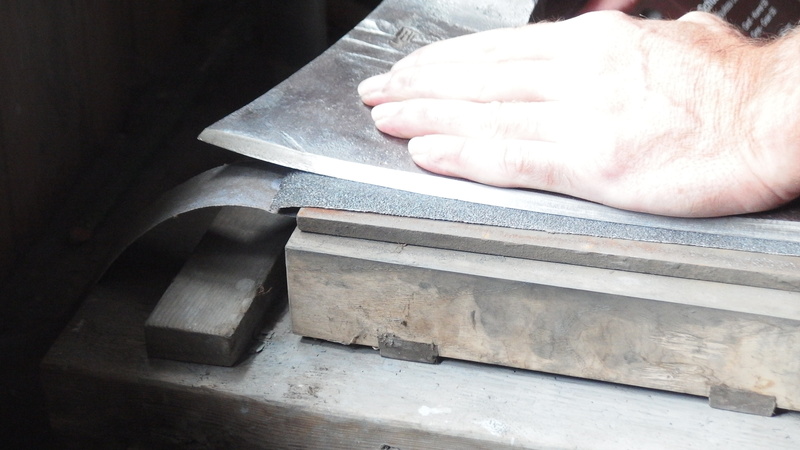 Do you know the saw-makers scraping tools? Fantastic but they could never get at flat. It's the lapping plate that's crucial once the concept(s) involved are grasped. I have 2 out of the 5...maybe just the bench..1 out of 5 lol! Gotta start somewhere, but when I have what I need I hope to jump in. I have to wonder, Miller, what is the condition of your axes' back-side. The saw maker's scraper, it's just a way to visualize what's happening, nothing more really. 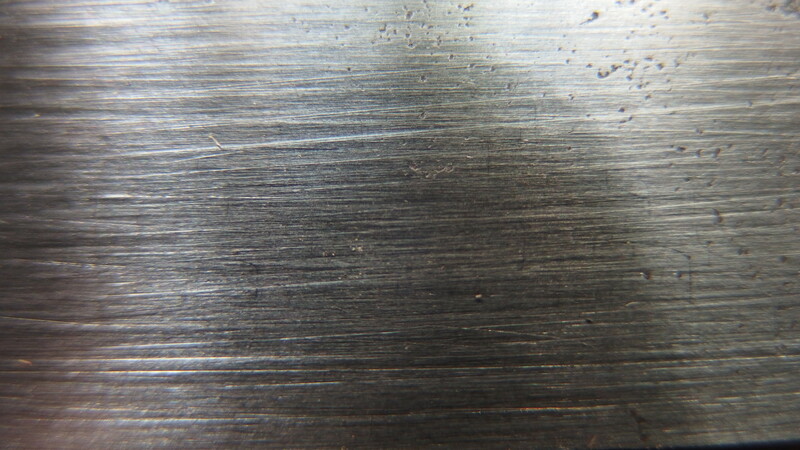 A lapping plate, one purposefully machined to the highest tolerances. 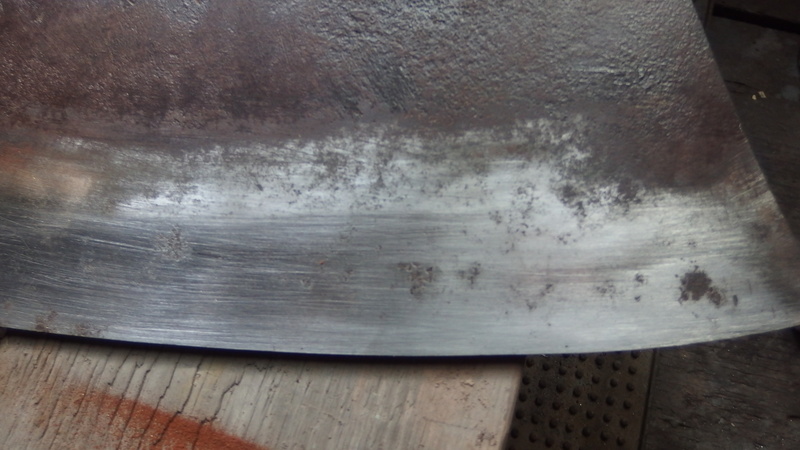 I admit to giving in to the bonded strips clamped a top for initial grinding because while a free grit spread out directly on the plate with water as dispersant is more accurate I go in this case for convenience and hope that further on in the process the damage done gets mitigated. I don't even know that going at it from a bench is the best proposition. There are times I work on the floor and can exert more pressure. It is pressure that is key. In one photo or the other it's clear for anyone to see I have almost gone from the point of grinding to burnishing which is not what's called for, the nice shine being a deception. Oops that is this photo, rounded furrows, glimmering background, better recharge the grinding surface. BamaDADx3 and Miller '72 like this. I will get the head cleaned up a bit and have a better look and idea. I will post some pictures here to show you as well what I am dealing with, opinions always welcome. I say, working on the floor defiently has its advantages and when needing to apply great pressure, I dont see to imagine a better position to work from for such a method. So I'll leave out the number of hours it takes since up till now the entries seem to be a motivating factor for you and I wouldn't want to alter that trajectory. Miller '72, A17 and Trailsawyer like this. I won't. It took 5 or 6 afternoons on a really misshapen ie ground on both sides 2lb broad hatchet. Sorry man. But my clean one took 1 hr more or less. Miller '72 and BamaDADx3 like this. Do you want to lay it out a17? I'm always looking for ways to ease the burden. First, you find a dead flat head.... 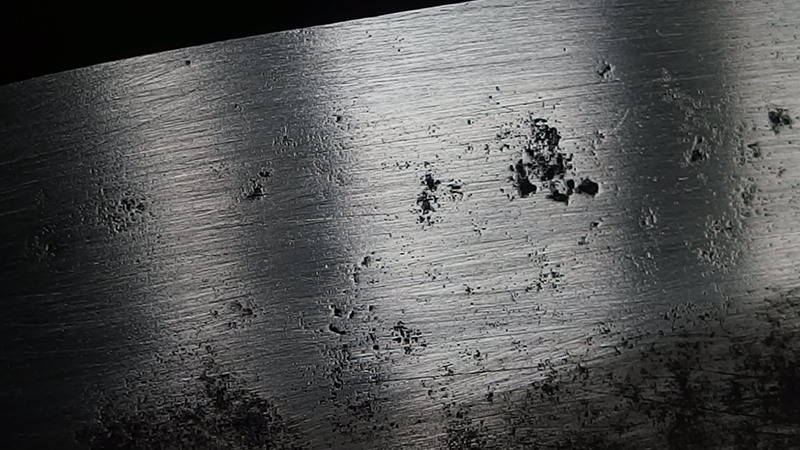 I initially use 60 grit sandpaper on a FLAT board to see how bad it is. If its pretty flat I do a victory dance and go to the next grit, if not I keep using 60 grit until it is 95% shiny on the back. Then I just progress up until 220 grit or so. If it is just near the edge, I try flattening the edge so the cutting edge looks like this <l and not like this <) (pathetic, I know) to remove most of it. The 2 lber was about 1mm out of whack over its length due to someone starting to double bevel it. But for $13 bucks hafted, what's a little hard work? What I show in the photos above is 50 grit action. Trailsawyer and Miller '72 like this. As I read it, what you are saying is with 5% of the surface area below the other 95% you move onto lighter grits leaving it at that. The 5% then is out of play and you're not concerned with it? It can explain the big time difference. Sorry, I made it unclear. 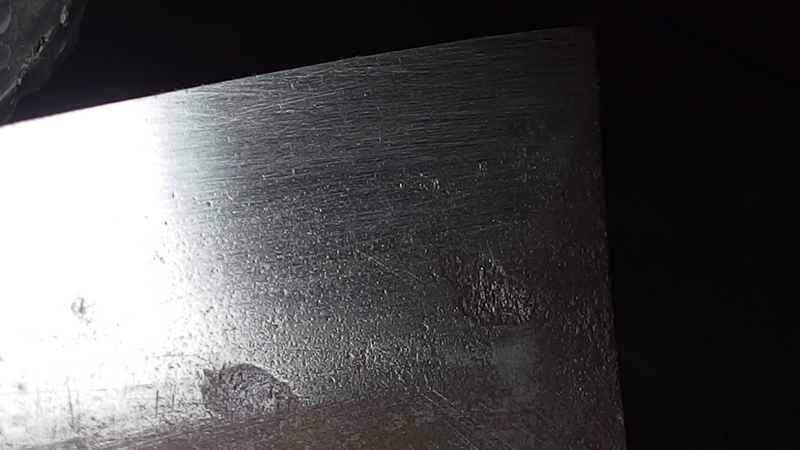 I get it flat for about 3 inches back from the cutting edge, or 95% of the edge flattened, the I polish the 3 inches with increasingly finer grits. The non-tempered area of the bit and the eye and poll I don't flatten and polish. The second one was dead flat which is why it took so much shorter. The first one took so long because someone tried to grind a second bevel that I had to sand down so the 3 inches would be flat. Is it any clearer now? Regardless, I'll post pics to help explain soon. Of course, we're going on and on and on about the, let's just call it what it is, operative section of the blade, everything beyond that being irrelevant. That section on the one hand is subjective, depending on use. The one dressing 3 inches back from the edge the other ±20 mm. On the other hand objectively speaking the definition of a sharp edge is a continuous line where two planes meet at zero degrees, setting out the conditions we are after. Square_peg and A17 like this.